A woman died Thursday, Feb. 2, 2017, when she lost control of the car she was driving and hit a tree on Meddler, in Spencer Township. Post photo by J. Reed. A 53-year-old Trufant woman died Thursday morning when she crashed into a tree in Spencer Township. According to Sgt. 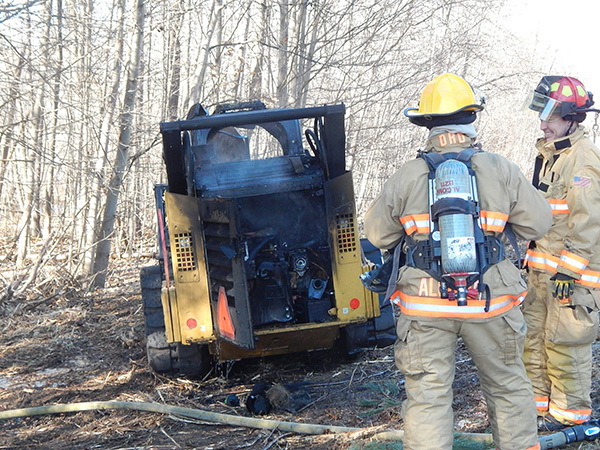 Corey Luce, with the Kent County Sheriff Department, the crash occurred shortly before 10:30 a.m. He said that according to a witness who was following, Luanne Crankshaw was headed northbound on Meddler near 20 Mile Road, on a patch of road covered with windblown snow, when she lost control of the 2005 Mazda Tribute she was driving and went off the east side of the road and hit a tree. The impact was on the driver’s side. Neither excessive speed nor alcohol appear to be factors. No other passengers were in the vehicle. Spencer Township Fire and Rescue, Rockford Ambulance, and the Kent County Road Commission assisted at the scene. Sgt. Luce said that is the second fatality this year. They had one in January, and one in February. By this time last year, there had already been five fatalities in Kent County. He said they had 24 between July and December, and also assisted other police agencies on two others, for a total of 31 fatalities in 2016. The Kent County Road Commission (KCRC), Barry County Road Commission, Ionia County Road Commission, City of Kentwood, and the City of Walker are enacting seasonal weight limit and speed restrictions due to the warmer weather we’ve experienced. The intent of the restrictions is to protect the integrity of the road when frost is coming out of the ground. Normal legal loads must be reduced by approximately 35 percent and truck vehicle speeds reduced to 35 mph. “We will be enforcing the restrictions based on this week’s forecast of rising temperatures and rainfall along with tests indicating frost depth of up to 36 inches. The enforcement of restrictions will help us protect the integrity of our non all-season roads as the frost comes out of the ground,” said Jerry Byrne, KCRC’s Deputy Director of Operations for KCRC. Byrne said that the imposed restrictions could be suspended as conditions warrant. Those with truck-related questions may contact the Michigan Center for Truck Safety at 1-800-MTA- 4MTA (1-800-682-4682). More information regarding KCRC’s Weight Restriction & Bonding Policy is available www.kentcountyroads.net. During a recent student tour on snow plow safety, Tim Fennema of the Kent County Road Commission explains to students about the new green lights they installed on trucks to increase their visibility and enhance safety for both motorists and crews. Photo courtesy of Kent County Road Commission. To promote enhanced safety during storm response and other road maintenance efforts, the Kent County Road Commission (KCRC) joins state, county and municipal transportation agencies throughout the state in installing green strobe lights on road maintenance vehicles. 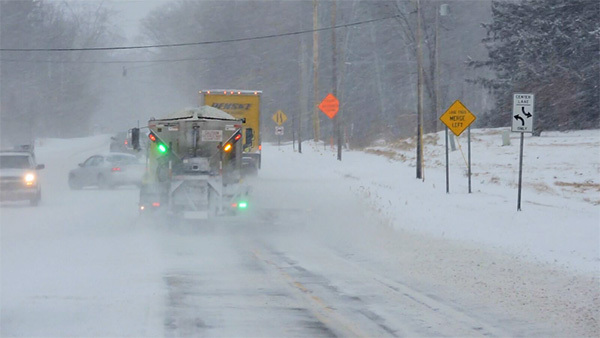 When motorists see green strobe lights, they are asked to slow down and be alert—a KCRC snowplow or road maintenance truck is performing work on the right of way. “Our vehicles generally travel at speeds of 25-35 mph when conducting storm response efforts or other road maintenance activities. The ability for motorists to identify our vehicles quickly improves their own response time in reducing their speed, which provides the necessary space between vehicles and improves safety for both the motorists and our workers,” said Jerry Byrne, KCRC’s Deputy Managing Director of Operations. *Improve the visibility of authorized public agency trucks while working in the right of way. *Differentiate a public agency’s vehicles from other private motorists and companies using amber lights. An example of a road commission truck with green lights while plowing snow. Photo courtesy of Kent County Road Commission. 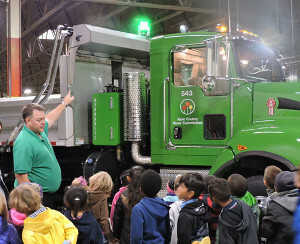 For the past few years, KCRC has been advocating the use of green strobe lights on road maintenance vehicles. 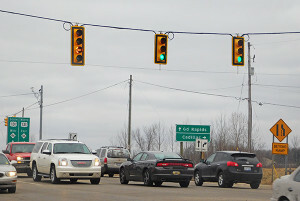 On September 7, 2016, an amendment to the Michigan Vehicle Code, Public Act 16 became effective, giving state, county and municipal transportation agencies the right to use green lights on their vehicles. 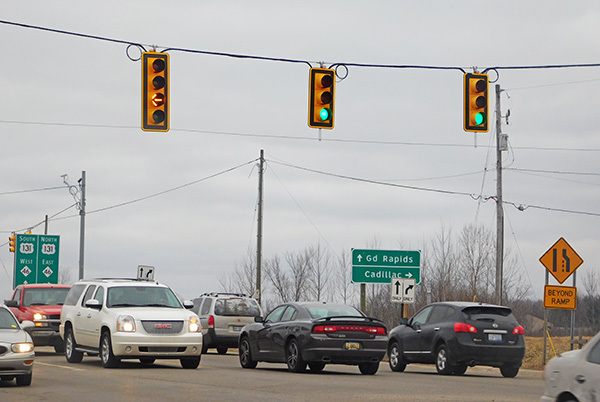 KCRC has been working with the Michigan Department of Transportation, the County Road Association of Michigan and other local road agencies to spread the word about the implementation of green lights on their road maintenance trucks. 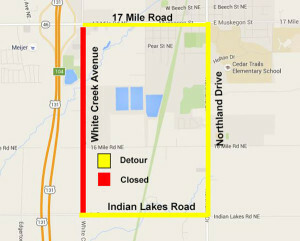 Those who normally drive White Creek Avenue between 17 Mile and Indian Lakes, will need to find an alternate route. It is closed to through traffic due to construction. 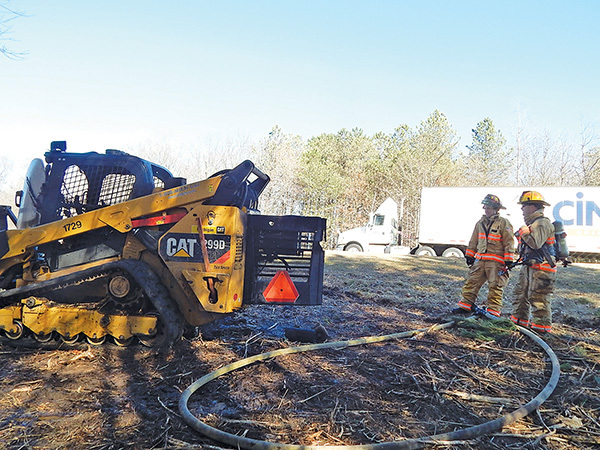 According to the Kent County Road Commission, during the resurfacing project existing asphalt surface will be crushed, regraded and compacted and then covered with Hot Mix Asphalt (HMA). 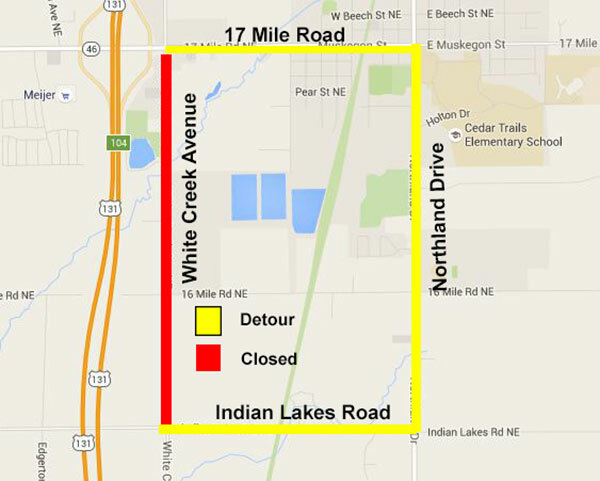 The section of White Creek Avenue will be closed to through traffic for the duration of the project, with anticipated completion by May 30. Leroy J. Mosher, 81 of Cedar Springs, died Tuesday, January 14, 2014 at Metron of Cedar Springs. Mr. Mosher was born February 23, 1932 in Cedar Springs, Michigan the son of Delbert and Myrtle (Carr) Mosher. He was a veteran of the U.S. Army serving during the Korean War and had worked for the Kent County Road Commission for 38 years. He loved going to garage sales. Surviving are his wife, Velda (Kruger); children, Cheryl Frost, Cherry (Dennis) Verburg, Jay Mosher; 7 grandchildren; 11 great grandchildren; sister, Edna Kimble. He was preceded in death by his son, Rick. A memorial service will be held Wednesday, January 22 at 11:00 am at Bethel Lutheran Church, Howard City. Pastor Steven Frentz officiating. Private family interment in North Ensley Cemetery. Memorial contributions may be made to Bethel Lutheran Church or Metron of Cedar Springs. 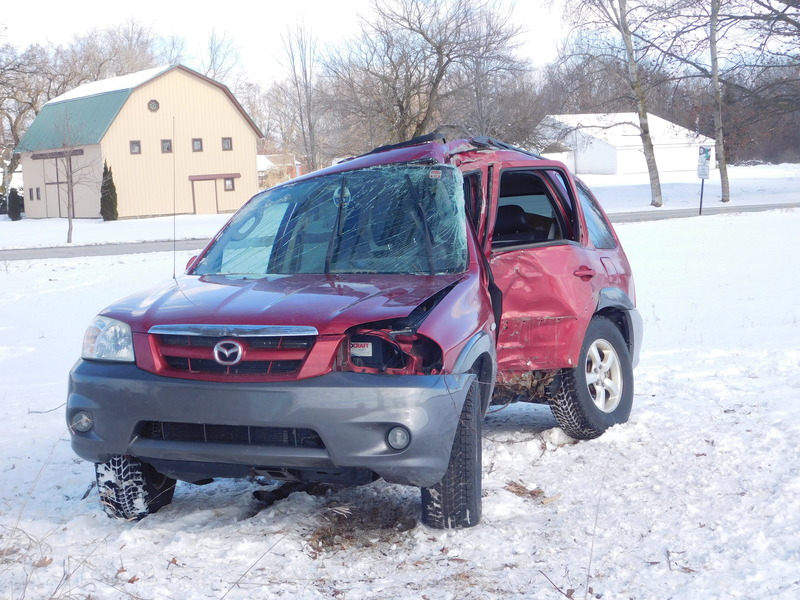 A Cedar Springs teen was sent to the hospital with critical injuries last Thursday afternoon, after he failed to stop at a stop sign and was broadsided by a road commission dump truck. According to the Kent County Sheriffs Department, Lee Brandt Tompkins, 18, of Spencer Township, was traveling east on 14 Mile Road, about 2:39 p.m., in a 2001 Chevy Malibu, when he failed to stop at the stop sign at Pine Island Drive. A fully-loaded Kent County Road Commission dump truck was traveling northbound on Pine Island Drive at the time, and not required to stop. 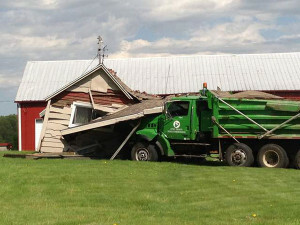 The Road Commission truck hit the brakes, but struck the car broadside on the passenger side, then went off the road to the right, over a ditch, through a yard, and into a house. The car was pushed up the road and into a ditch on the west side of the road. Tompkins was taken to Butterworth by Aero Med with critical injuries. The Road Commission driver, Steven Mark Blossom, 60, of Grant, suffered minor scrapes on both arms and top of head. He was not transported to the hospital. Both drivers were wearing their seatbelts, and alcohol was not a factor in the accident.